The 720p indoor dome cameras from bosch are professional hd surveillance cameras that provide high quality images for demanding security and surveillance network requirements. 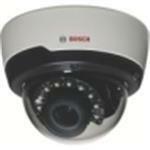 these domes are true day/ night cameras offering excellent performance day or night. there is a version with a built-in active infrared illuminator that provides high performance in xtreme low-light environments.